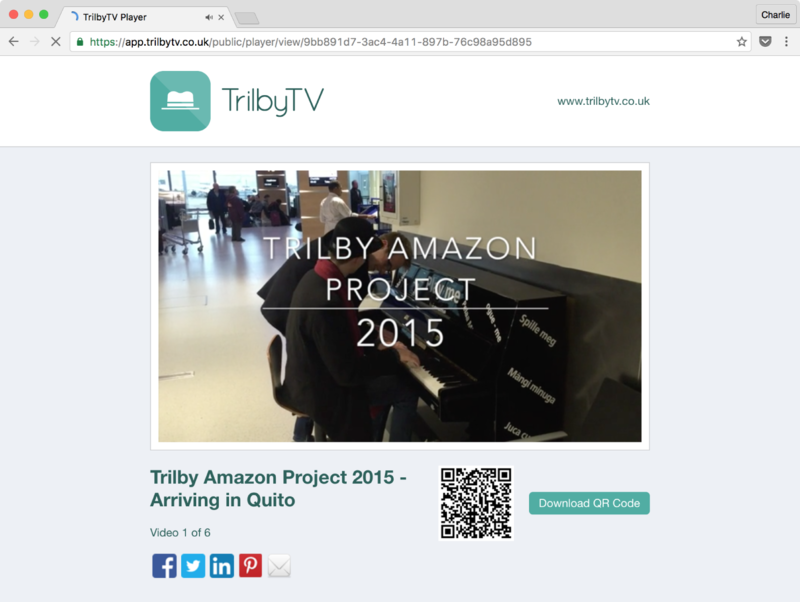 Just like with our TrilbyTV Player apps, you can choose to share based on a selection of categories, or a curated ordered playlist of videos. And for privacy, only videos marked as available for Public Access can be seen in Embedded Players. If you choose a category based player, you just need to click the categories you want to include, and decide if you want playback to be shuffled. The category selection screen will tell you how many videos are included in your selection, and if any videos won’t be show. If you choose a playlist based player, you’ll see our playlist creator where you can filter your available videos, and add them to your timeline by dragging or clicking Add. You can then reorder videos as you need by dragging them around. Then simply add a Name for your playlist and save. Public Link: this is a standalone web page that will play back your videos. Share this on social media, in emails or via a link on your website. Click on the image below to see our Embedded Player for director Neil Emery’s Amazon 2015 adventures. You can also use Embedded Players to run web-based digital signage players if you’re not using a TrilbyTV Player, such as VisioSign. Embedded Players are available now for all Admin users.